Police were called at 22:33 BST on Wednesday to reports of a man injuring people with a knife, including a woman in her 60s who later died. Police using a Taser arrested a man of 19 who is being held under armed guard at hospital. The Met said mental health was a "significant factor" in events. London Mayor Sadiq Khan called for the public to remain "calm and vigilant". 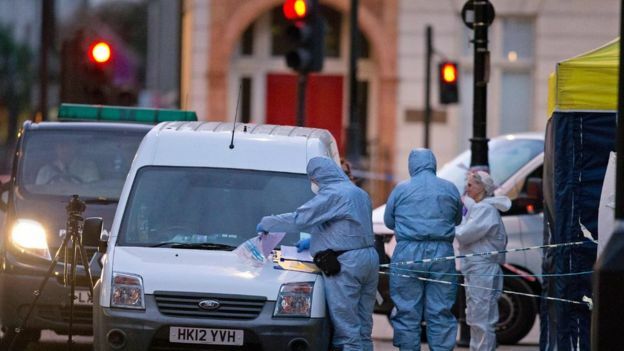 The Met's assistant commissioner for specialist operations, Mark Rowley, said the force's homicide command was leading the investigation into the attack, with support from the counter-terrorism unit. Paul Ó Geibheannaigh, who lives near to the square, said he had seen the body of the woman "on the pavement" and the area was surrounded by a "heavy armed police presence". "I haven't seen a police presence like that in this area since 7/7," he said, referring to the terror attacks on the London transport system in July 2005. A witness, who wished to remain anonymous, said he saw the suspect being chased and Tasered. He said the "guy kept screaming his guts out" and "police were screaming 'stop, stop, stop'". After the man was Tasered, he said, the man was on the ground "for at least 30/40 minutes" while police waited for an ambulance. Zuhair Awartani was trying to return to a hotel where he was staying when he saw a "dark-skinned man" in his "late 20s" being arrested. He added: "We heard that there's been a stabbing going on. The streets were blocked and no-one was allowed through." Speaking about a motive for the attack, Mr Rowley said: "Of course at this stage we should keep an open mind regarding motive and consequently terrorism as a motivation remains... one line of inquiry for us to explore." Mr Rowley added that Londoners would see an increased police presence on the streets, including armed officers, to "provide reassurance and safety". Mr Khan said his "heart goes out to the victims of the incident in Russell Square and their loved ones". He said police were doing an "incredibly difficult job" and the safety of Londoners was his "number one priority". The mayor added: "I have spoken with the commissioner, and the assistant commissioner, who have assured me that our police officers are working extremely hard to investigate exactly what has happened and to keep the rest of us safe. "A man was arrested at the scene. Police have spoken to him and are seeking to establish the full facts including motives for this attack. I urge all Londoners to remain calm and vigilant."